My name is Uwe Aranas. I was born 1964 in Heidenheim, Germany. After graduating as chemical engineer, I was hired by a Technical Inspections Organization. I am earning my life as pressure vessel expert in the field of industrial safety. I was a boy when my father helped me to manufacture a wooden cubical box with a side length of 30 cm. He was a vocational teacher and at that time, his subject was photography. This summer in the early 1970's, I managed to produce a blurry shot of our house with my home-made Camera obscura and still today I think, that this moment pioneered the way for my life long enthusiasm for photography. The workshop area of my father housed at that time a small chamber of approximately 2m x 1.2m that was not accessible for us boys and we had to get a special permit to enter the darkroom with this conspicious odour of chemicals and all those instruments and apparatuses, that the "digital generation" of photographers never got acquainted with. I was eager to help my father, and eventually proved to be a good assistant. After spending some time with shaking JOBO tanks, handling the exposed paper sheets in the bassins with developer, stop bath and fixer, I was awarded with my first regular camera, a Rollei 35 B. Not much of my photographic work as teenager survived study and several relocations. Times have changed, as well as my photographic equipment. Though the todays workflow in digital photography is a little bit different, I still take advantage of the B/W experiences of my boyhood. 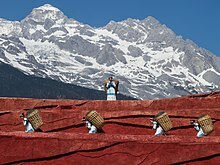 I started to contribute to german Wikipedia with the special scope "Sabah" some years ago. Getting notified, that there were only few photos available, I started a photo documentation project for this remote federal state of Malaysia which is still going on. Beside this time consuming work, I indulge in portrait and studio photography and in taking pictures of all kind of buildings and objects, that might be of encyclopedial value.